I special ordered my 2007 Toyota 4Runner and it took 5 months to receive the vehicle. This page will, in effect, be a blog of my purchasing experience and an attempt to clear up some misinformation out there in terms of calculating true invoice price, MSRP pricing, preference orders, special ordering, etc. Yes, it is possible to special order a Toyota 4Runner. If you are purchasing rather than leasing, plan to own for a long time, and cannot find precisely what you want in stock, I highly recommend doing a special order to get exactly what you want. Toyota vehicles are available for purchase at your local dealership in what is termed as "Popular Equipment Combinations". What this means is that each vehicle model is available in a limited amount of popular option configurations. The equipment combinations vary by region. As a starting point, you should be aware that the Toyota 4Runner is available in 12 different models. There are three trim levels; SR5, Sport Edition and Limited. Each trim level is available with a 2WD or 4WD drivetrain, with either a V6 4.0L or V8 4.7L engine...For a total of 12 distinct model numbers. Each model number will be available in a limited amount of popular equipment combinations which will vary by region. Toyota Motor Sales, Inc. is an American company in charge of overseeing the sales and service efforts of Toyota in the United States. There are 12 regions, each responsible for the dealer network in their area; Boston, New York, Central Atlantic, Southeast, Cincinnati, Chicago, Kansas City, Gulf States, Denver, Portland, San Francisco and Los Angeles. I began my quest for a new 4Runner by obtaining the 2007 4Runner Brochure that Toyota produces each model year. From there I picked the model and options I wanted. Some options or packages are available on certain models only, or they may require another particular option or the exclusion of a certain option. Special ordering a vehicle does not mean you can circumvent these basic rules. For example; you cannot get cloth seating on a Limited model, the navagation system option requires the option for the Homelink universal transceiver garage door opener, you cannot get the third row seating option with a vehicle equipped with XREAS suspension, etc. Create your ideal vehicle by using that brochure. For me, I knew I had to have 4WD (fulltime) and the V8 4.7L engine. Then on to trim levels. The SR5 was out as I do not like the black mirrors, chrome door handles and license plate garnish. I definitely wanted the hood scoop, graphite painted roof rails and tubular side steps which are available only on the Sport Edition. Also I definitely wanted the XREAS suspension, leather tilt/telescopic steering wheel, power color keyed heated side mirrors, power seats which are available as standard equipment on both the Sport and the Limited. Now, looking at the Limited models, things on that which I did not want were the leather seats, 18" wheels, and the $4,755 price increase over the Sport Edition. So I determined what I wanted was Model #8686 a Sport Edition 4x4 V8. (CM) Double Decker Cargo System $100/$125. Looks nice on paper, less useful in reality, makes it difficult to use a cargo liner or requires a second upper liner, rounded edge near liftgate allows items to roll out of cargo area upon opening door, additional 2" cargo space lost due to thickness of shelf. (EC) Automatic Inside Day/Night mirror with Compass $120/$150. Don't see the point of a dimming mirror with a tinted rear window, hardly ever dimmed my regular mirror on my 1999 4R with tinted rear glass, don't really need a mirror compass with a navagation system. (SR) Power Glass Moonroof $720/$900. I wanted to maximize headroom by not ordering this option, also wanted to avoid having this additional cost now and the cost of reparing it down the road. I never did have a problem with the sunroof in my 1999 4R I owned for 8 years, but always worried if/when it was going to leak. Never used it much anyhow. 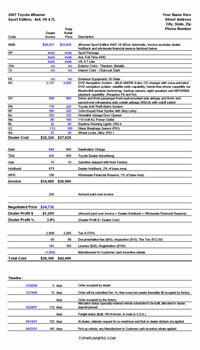 (EY) Rear Seat Entertainment System (Requires SR) $1,264/$1,580. If I wanted a rear seat DVD/entertainment system I would pay a little more and get aftermarket dual headrest mounted monitors, which I may someday consider. I would not want the celing mounted monitor of the factory system blocking my rearward view, also would not want my kids to look up and to the center to see the screen when they could look straight ahead at headrest mounted screens, less neckstrain. Also this option requires the factory sunroof which I absolutely did not want. I am no stranger to either Toyota or 4Runners. I purchased my first 4Runner 8 years ago in 1999. At that time the 4Runner "Highlander" was just making it's debut. I did my research on vehicles in the same class and came to the conclusion that there was no comparison at all to the Toyota 4Runner. The 4Runner had it all...full body on frame construction, powerful engine with high torque, very off road capable, good looking, great on road manners, Toyota quality, etc. The same stands true today. At that time I was eager to get this new "Highlander" model that I took what was available locally. While a great vehicle it was lacking one or two options that I would later regret not getting. I came to see how worth it it is to wait for a special order vehicle, that is if you have the ability to wait, which from Toyota can take typically three to six months. There was no need for me to test drive or even see the 2007 4Runner in person, I just knew what I wanted. But if you need to visit a dealer, now would be the time. A tip here is to choose a dealer that you know you do not want to buy the vehicle from and do all of your research there. Get your brochures, sit in, look at options, test drive various models at this particular dealer. Notice I did not say to ask questions at that dealer. Sure you can ask questions, but take them with a grain of salt. Dealers sell so many various vehicles and models of vehicles that there is no way you can expect them to be an expert in them all, and believe me they are not. Ask all your questions on the various dedicated internet forums and you will get real world answers from experienced owners and enthusiasts. The reason for going to a dealer that you do not want to purchase from is because they will try to make a profit which is commensurate with the time they spent with you, and perhaps rightfully so. But our goal is to pay the lowest price. You will not be able to demand a minimum price over invoice from a dealer in which you wasted countless time of theirs. My strategy when purchasing a new vehicle is to have all my research complete and know exactly what I want and exactly what I am going to pay even before I set foot in the dealer in which I will buy the vehicle from. I will explain below how to calculate exactly what you will pay for the vehicle. What I do when ready to buy, is to walk into the desired dealer with a single sheet of paper and hand it directly to the first person to greet me. I tell them straight up I am here to buy a vehicle right now and within the next 5 minutes (knowing you will be there longer obviously) and that here is exactly what I want and what I am willing to pay for it. I mention that I know that such a vehicle is either available locally (within my region), in another region (which the dealer can get allocated to my region), or available via special order only. I tell them I am not there to waste their time with a test drive or even asking a single question about the vehicle. I am strictly there to buy and sign a contract on the spot. When they know they can make a sale immediatly and move right on to the next customer without wasting any time or effort, they will be very willing to agree to a price that is minimally over invoice. With that in mind, the next step was to price out the vehicle I came up with. So I created a spreadsheet, which I am making available for download in Microsoft Excel format for you to use. This spreadsheet calculates not only the true invoice price, but also the dealer cost of the vehicle. They are different. This will arm you with the information you need to negotiate the best price for your vehicle configuration while remaining profitable enough for the dealer to accept the offer. I will walk you through this spreadsheet section by section. The spreadsheet is pre-populated with my exact vehicle configuration. You will change certain items to the configuration you desire. Start by entering the year of the vehicle, the trim level, drive configuration and desired engine at the top (cells B1..B2). Enter your contact info in cells F1..F4. Remember you are going to hand this sheet to a salesman and if for any reason you need to walk out, they can read it at their lesiure and have your contact info handy. To begin calculating the dealer cost for the vehicle. Start your pricing research at both Kelley Blue Book and Edmund's.com. At those websites you will be able to get the option codes as well as the Invoice and MSRP prices. Add or delete rows as needed to the worksheet for all the options you want. Pay particular attention to the amount for the base price of the vehicle, cell C8. Remember, we are calculating the price that the dealer pays Toyota for the vehicle. To do so accurately you will need to exclude the dealer holdback and wholesale financial reserve from the base invoice price displayed on the KBB or Edmund's websites. The wholesale financial reserve is 1% of the base MSRP price and the dealer holdback is 2% of the base MSRP price. The dealer holdback and wholesale financial reserves are a way for Toyota to offset the costs incurred by the dealer to hold the vehicle in inventory for 90 days. So when a dealer pays Toyota invoice price for a vehicle, Toyota "holds back" these two amounts and kicks them back to the dealer on a quarterly basis. The holdback is to offset costs incurred in maintaining a dealership. The wholesale financial reserve is to offset the interest expense incurred when the dealer takes a loan out to buy a vehicle from Toyota and put it on it's lot waiting for someone to buy it. Now you may be asking yourself, if I am doing a special order, the dealer has no theoretical carrying costs on this particular vehicle, so can I negotiate these amounts down. Short answer is you most likely not have any luck. But you should try to get as close to "invoice price" as possible as you are aware of this built in profit. So now you have added rows for all the options you want, you have keyed the invoice and manufacturer suggested retail prices for each line item, and have arrived at the total dealer cost. This is what the vehicle will ultimately cost the dealer. We will now calculate "invoice price". To get from dealer cost to invoice price you need to add the following items: Destination Charge, Toyota Advertising, Gasoline vehicle shipped with from Factory, Dealer Holdback and Wholesale Financial Reserve. (DEST) Destination Charge - Special order or not the vehicle is coming from Japan and you will bear the shipping costs. The amount for destination charges is available at Edmund's or KBB. (TDA) Toyota Advertising - This is a legitimate part of the invoice cost that you must pay. The amount, $500 in 2007, is not available on Edmund's or KBB. You need to see a vehicle inquiry report (more on this later) at the dealer to get this exact amount, but like I said $500 is the amount for 2007. (GAS) Gasoline vehicle shipped with from Factory - The vehicle ships with a minimum amount of gas that is added when the vehicle is built, typically 3 gallons, and again you pay for it ($10). The good thing is that when you take delivery of your new vehicle you should expect a full tank of gas to be included. Since the 4th Gen 4Runners have a 23 gallon gas tank, you are actually getting 20 gallons of gasoline for free. At the time I took delivery gas was $3.199 per gallon for regular 87 octane. Calculating this out, I received $64 worth of gas that was not included in the invoice. Not bad. (Holdback) Dealer Holdback - legitimate charge discussed in detail above. 2% of base msrp price or for my model $673. (WFR) Wholesale Financial Reserve - legitimate charge discussed in detail above. 1% of base msrp price or for my model $336. So now we have arrived at Invoice Price. That being said, the column included for MSRP was included on the spreadsheet for informational purposes only. It means absolutly nothing. You should never deal down from MSRP. Always deal up from Invoice. $ 0 over invoice is 3% over dealer cost (2% dealer holdback + 1% wfr). $125 over invoice is 3.5% over dealer cost. $300 over invoice is 4% over dealer cost. $600 over invoice is 5% over dealer cost. Personally from my experience $200 over invoice (3.7% over dealer cost) is easily obtainable on a vehicle already sitting on a particular dealer's lot. Special orders are another story. At first you would think that you should be able to buy a special order vehicle at the same if not lower amount over invoice as a vehicle already on the lot. Reason being that you are providing an easy sale which the dealer would not get otherwise and does not even take a vehicle off their lot which they can then turnaround and sell (try to sell) to the next person walking in. 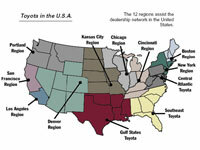 But it does not work that way as Toyota dealers work off an "allocation" methodology. A special order vehcile uses up one allocation slot. Since a vehicle may take three to six months to be delivered to the customer, the dealer has to evaluate if it is worth it to use up an allocation slot. If they do not have many 4Runners on their lot because they are selling them quickly don't count on them to be willing to waste an allocation slot. The more you are willing to pay over invoice, the more likely they will be willing to do so. A little more info on the allocation methodology. Toyota's methodology of distributing vehicles to it's dealers is know as the "balanced day's supply method". As such, Toyota allocates vehicles to it's dealers once every two weeks usually on the 1st and 15th of the month. The method uses a formula that assigns available vehicles in a particular region based upon each dealer's inventory and recent sales volume. The method does not simply replace vehicles sold on a one-to-one basis but rewards past sales performance, so that successful dealers do better than unsuccessful ones. Dealers do not have to accept every vehicle earned in a periodic allocation, and each region has its own method of reallocating such rejected vehicles. "Turndowns" are first offered to dealers within the same district where they were originally assigned, and if unclaimed they are offered to all dealers in the region as "port stock". The district manager has discretion in offering vehicles to the dealers. Toyota informs dealers about the vehicles it has in port stock by fax and dealers may claim those vehicles on a "first come, first served" basis. Understanding the above I decided to start at asking for $100 over invoice anyhow, knowing full well I would be willing to pay up to $500 over invoice if I really had to do a special order. Now that I had in mind exactly what I wanted, and what I wanted to pay, I needed to find out if Toyota was building them the way I wanted. On the Toyota website you can click on the "build and price your Toyota" link. The site will ask for your zip code. The site then knows which of the 12 regions you are in. When you begin to configure your vehicle by choosing on the model you desire, it will show you the popular option combinations available in your region. Remember, this is how the vehicles on dealer lots in your area will be configured. If what you want is not being made in your region, you can go back and choose the zip code of a different region to see how they are being made for other regions. This tells you that the factory is indeed producing your desired configuration for some region and if you go that route you will not be doing a true special order. You see, the factory is producing you configuration and it is up to the dealer to put in a "preference order" to see if the factory can divert one your way. If that is not the case and all 12 regions do not configure the model you want how you want it, as it was in my case, a special order is the only way to obtain the vehicle. Now there are many dealers that will tell you a true special order cannot be done. They will give you many reasons. Don't waste your time if you begin to hear that. A true special order can be done, they just may not want to do it. That fine too, just walk out and find another dealer, it is well worth it. You do need to understand the process though. If the dealer accepts your offer they need to fax in the request. The only time they can do so is on the 1st and the 15th of each month. Since you did your research you need to let them know you are an informed and educated customer and that you do not want them to "preference" order, to call around to other dealers for a swap, to wait for a turndown, or to check port stock. You know Toyota is not making them that way for any region and you are willing to wait up to 6 months if need be to get exactly what you want. You do not want to be strung along while they check these other venues as these methods will not produce your desired configuration. Why the six month waiting time you ask. You are right it does not take 6 months to build and deliver a vehicle from Toyota. You can get it significantly sooner. What does take time though is that the factory does not have to accept your order either right away or at all. The factory has to stop the production line for unusual combinations of options. If they are in a peak period of production they will not do so. Your dealer has to stay on top of the order and resubmit the order if denied until accepted. It is possible that in theory your vehicle will not ever get accepted. Many dealers are reluctant to do a special order for fear of upsetting the customer if in fact the vehicle never does get built. This is something that I had to convince the general sales manager of my dealership that I was OK with. I assured them that if the factory did not build it exactly how I wanted it and the model year ended I would be fine with no vehicle at all. In return they agreed to not require a deposit until the factory accepted the special order. As I mentioned, no region was configuring vehicles to my desired specifications. So what made my configuration special? Sport Edition models always come with the sunroof in my region. I did not want that. I did see other regions that had the Sport with 4WD and the V8 without the sunroof, not many though. Those regions that offered it without the sunroof never had it with the side airbags and the factory navagation system. Getting the vehicle without the AC 115v power outlet or with the double decker option would not be a deal breaker. But it absolutely could not have the moonroof and it had to have the side airbags and Nav. Hence a special order was in the making. There are side benefits of a special order, although they may not be a big deal to you they were for me. A vehicle sitting on a dealers lot is subject to more abuse than you can imagine. First of all it can be test driven and those few miles will be the hardest miles ever put on the vehicle. If you are an enthusiast like me you will want to go through a proper break in cycle and will not appreciate the test, or rather "joy", rides that have occured. Next a dealer may trade a vehicle of theirs to get one matching your request from another dealer which may not be so close by. The "runner" will, as you can imagine, have a blast with your new ride getting it from dealer B to dealer A while most likely not adhering to the proper break in schedule. Also, think of how long a vehicle sits on a lot on average. Could possibly be quite some time. At some dealers they wash the vehicles sitting outside on a daily basis. If not at least a few times a week. They want to have them looking nice and clean for a potential customer passing by. What they are really doing is having their lowest paid workers power blast the crap out of your brand new paint and subsequently dry it down with the filthiest rags you ever saw, introducing tons of swirl marks. Again a true enthusiast will only hand wash their vehicle using the highest grade products and 100% made in the USA cotton cloths, etc. A vehicle sitting on the lot for one month may get more swirl marks in that period then an enthusiast may subject their vehicle to in 10 years of ownership. A special order will avoid all these things. I went so far as to have written into the contract that I did not want any dealer preparation at all in terms of washing, detailing, armor alling the interior, etc. So now it was time to actually get out there and hit the dealers in person. Took my spreadsheet, filled in at the time to reflect a $100 over invoice price, and headed out. Went directly to the place I really wanted to purchase it at, which was the closest dealer to my house. Went through my standard shpiel upon being greeted by a salesman. "Hi, I am here to buy a very specific vehicle and would like to do so within the next 5-10 minutes." "Here is exactly what I want, no exceptions at all. I know Toyota does not build them this way by default, and I would like to place a special order." "I am prepared to place a deposit immediately". So of course we sit down and the salesman, thinking he knows more than his customer, heads to check his inventory and do whatever else they do when they head to their managers office. When he comes back he proceds to inform me, incorrectly or course, that they cannot get a Sport Edition 4WD V8 without a sunroof. So I begin to inform him that I have fully done my research, am a current 4Runner owner and have been active in the 4Runner online community for the last 8 years. I know what can and cannot be built, and I know what others have had special ordered. Again he goes away, comes back and says that the model I picked cannot be ordered with a factory navagation system. I inform him of my time limit and that at this point he should just come back with the manager if they want to sell a vehicle today. He does so and the manager says that if they even could get this vehicle special ordered, they would only do so for $1,000 over invoice. I politely thank them and walk, telling them that by the end of this week I will have the vehicle ordered somewhere else. The salesman grabs me on the way out and asks if they can call me on Friday to see if I have done so. I agree. So, without making this page much longer and iterating every detail, I hit a few more dealers that day and the next. To my surprise no one was interested in doing a special order. I did have a place or two tell me they would agree to the $100 over invoice but only if it is on something in stock. I left my contact info with each dealer and made it my point to show them that I was in no rush to buy and that eventually I knew I would get what I wanted. One point I would like to make is that it is very important that you emphasize (in a nice way or course) to each dealer that you indeed want a special order performed asap and that you do not want them to string you along while they search other dealers for a transfer or wait for a preference order to materialize. You know it may take 3 to 6 months but are happy to wait. I have heard a few horror stories online whereas a dealer would wait for weeks and months to ultimately inform the buyer that the vehicle came in "incorrectly" and was close but not exactly as ordered. I find this somewhat hard to believe and feel that in at least a case or two a dealer must have just waited around for something to come in close to the desired vehicle, figuring that the customer would eventually give in and just buy what they could obtain. So on to plan B, the email/fax/online method of purchasing a new vehicle. I called a few dealers and asked them to speak with their internet manager if they had one. I either faxed or emailed or read them over the phone the options as per the spreadsheet discussed above. Only one place was willing to special order but only for $500 over invoice. Not bad, and at least I found someone to work with. But I kept in mind that the first dealer said he would call at weeks end to check my progress. I really wanted to buy locally and really wasn't in a rush so I decided to wait it out. I was sort of surprised when the first dealer actually did call back. I explained to him I had a pending deal in writing for $500 over invoice and that I was still looking around as I knew I could get it for lower. I told him I wanted to buy it from his dealership as I preferred to have my vehicle serviced where I bought it from (in reality I avoid the dealer like the plague and do all my own maintenance that I can myself) and that he would have to beat that price for me to come back. Additionally I informed him I could not return for another week. Again I wasn't desperate, and made a point to show them that. I was able to get a vehicle inquiry report from the online dealer faxed to me. A "vehicle inquiry report" or "inventory detail sheet" is a report that has all the cost related info about a particular vehicle which has been allocated to a dealer. Since I was doing a special order the vehicle obviously had not been built, and therefore the vehicle inquiry report was for a vehicle that the dealer had recently sold and was for the same model I wanted, but had one of the standard option configurations for the area. The online dealer marked it up to reflect the deletion of certain options I did not want and the addition of others I did want, thereby creating an invoice sheet for my desired vehicle. This came in handy when proving to the other dealer I had a deal on the table. This vehicle inquiry report is an excellent way of confirming exact pricing of certain items such as TDA, Gas, Holdback and WFR, which may not be easily obtainable otherwise. Note to readers...This page is not yet completed, but will be soon. This is the only page on my site that is a work in progress. I did not originally plan to do a purchasing blog, but have been getting many questions on how I not only special ordered but was able to do so for a net net ($1,300) under invoice cost. Thank you for your patience, and hope you found what I have completed so far a little useful.